Combell recently started providing the Veeam Cloud Connect Backup Service, which allows you to have an online backup of your business-critical data at your disposal in a secure and redundant data centre. Your backup is constantly synchronised and can, if necessary, be instantly restored to your local infrastructure. This new service has been developed based on Veeam backup services. But why exactly did we make this choice? Veeam knows how challenging it is to make sure that a company remains operational at any time and has therefore developed solutions that use technologies of a modern data centre, which ensure fast recovery, and secure and optimised data transmission. Veeam does not require agents – for both backups and recovery. And yet, it offers all the features for which traditional backup tools require agents, such as granular recovery, Windows and Linux guest file system indexing, and application-aware backup and recovery. Built-in WAN Acceleration uses global caching, traffic compression, and variable block length data fingerprinting. When you need to replicate your data or your backups to an offsite location, Veeam knows which data blocks are already there, which reduces the quantity of data to be transmitted via the WAN connection. vPower technology allows for instant VM recovery: when a virtual machine fails, you can restart it on any host in just a couple of minutes. It is no longer necessary to extract the backup and copy it to production storage. Although Veeam uses image-based backups that allow for fast recovery of a whole machine on any possible host, it is also possible to recover individual files thanks to File-Level Recovery (FLR). You can recover guest files directly from a compressed and deduplicated image-based backup, without having to recover the whole VM. With the Explorer technology, you can recover individual items directly from various applications: Microsoft Exchange, Microsoft Active Directory, Microsoft SQL server, Microsoft SharePoint. The SureBackup tool verifies the backup’s recoverability, for each backup that you make, for each VM. Built-in compression and deduplication at source help reduce the size of the backup. This way, you need less storage space and bandwidth. Built-in WAN acceleration is handy for backups, but also for copying backups to offsite locations. 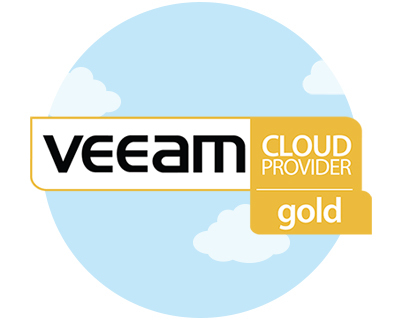 Veeam Cloud Connect creates your backups or copies them to the Combell data centre via the Internet, using a secure SSL connection. Veeam is storage-agnostic, which means that you can use it on different servers and storage media. The software is easy to install and configure. Do not forget the 3-2-1 rule for backups! You can just purchase the Veeam backup software; Combell has entered a partnership with Dutch company Tyneso, which sells the Veeam software and also provides support for the installation. However, do not forget the crucial 3-2-1 rule for backups! This rule states that you should store three copies of your data, on two types of storage media, of which one copy should be stored offsite. The first thing you need to do is purchase and install the Veeam backup software. But using Combell’s Veeam Cloud Connect Backup Service is the keystone that makes your backup procedure foolproof, because from now on, your backup will be automatically created and stored offsite. Once you have installed the software, request your registration at Combell. In the Veeam Cloud Connect feature of your backup software, enter the data Combell provided you with. From now on, you can rest easy: your external backups will be created automatically. And if a disaster should happen, you can just restore the backup via your console in the Veeam software, without any intervention from Combell. Everything happens automatically. Amazing, isn’t it? Find out more about the reasons why you should choose Combell as a Veeam Cloud Connect Backup Service provider.